Director Michael Noer delves into the life of Henri ‘Papillon’ Charrière with the second feature film based on Charrière’s autobiography. 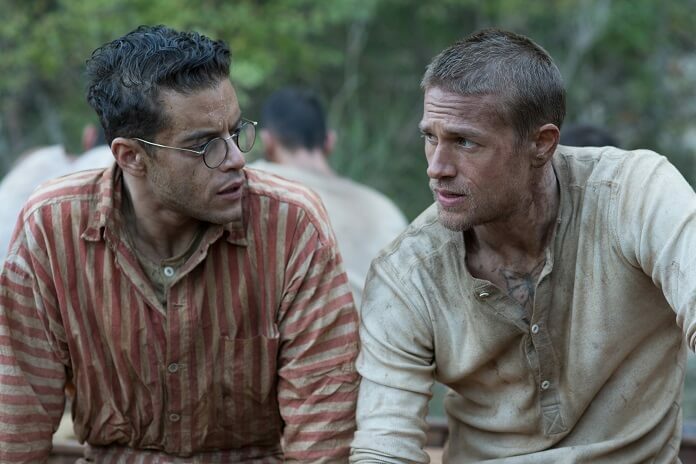 The 1973 Oscar-nominated version starred Steve McQueen and Dustin Hoffman, with Sons of Anarchy’s Charlie Hunnam and Mr. Robot’s Rami Malek taking on the lead characters in the 2018 adaptation of Papillon. The 2018 action drama is a slick adaptation meant for an audience unfamiliar with the original movie. Film fans who appreciate the original may not be quite as taken by this 2018 version which goes over familiar ground without adding much to the story. The film opens in Paris in 1931 with Henri (Hunnam), nicknamed Papillon (or ‘Papi’) after the butterfly tattooed on his chest, spending a wild night partying with his girlfriend. He’s just pulled off a jewelry heist and gifts his girlfriend a necklace he’s withheld from his boss, an act he’ll regret the remainder of his life. The crime boss gets even for Papi’s brazen act of withholding some of the heist’s bounty by framing the safecracker for murder. He’s given a life sentence and told he’ll never be able to set foot again in France. Papi finagles it so that a wealthy fellow prisoner, Louis Dega (Malek), comes to depend on him for survival inside the French Guiana prison. Papi agrees to protect the counterfeiter in exchange for Dega financing his escape plan. The film then tracks Papi’s time in prison, his multiple escape attempts, and explores why he was able to survive years in solitary confinement when other inmates perished from the same harsh treatment. The R-rated drama also explores Papillon’s enduring friendship with Dega, a relationship that drove much of Papi’s actions behind bars. Director Noer does a terrific job of capturing Papillon’s confinement, and he smartly cast two very appealing actors in the thriller’s lead roles. Charlie Hunnam’s The Lost City of Z was one of 2017’s best dramas, and Rami Malek’s Mr. Robot is one of television’s most engrossing shows. Together, the men have solid chemistry as prisoners joined together to survive brutal circumstances. There’s a truth to Rami Malek and Charlie Hunnam’s take on these characters, and Hunnam in particular delivers an engaging performance, bringing an underlying vulnerability to Papi that makes him accessible to the audience. The vulnerability that runs through the character is hidden in an outward show of strength as he displays an unfailing determination to escape after being falsely convicted of a crime he didn’t commit. The sadistic prison warden attempts to break Papi, but he refuses to allow himself the appearance of being tamed. Yet in quieter moments, Hunnam allows Papi to show what’s stirring inside. Papillon is beautifully shot and the acting’s top notch. The pacing’s a little clunky, but overall the 2018 adaptation is a compelling tale of loyalty and the strength of the human spirit.